"Elias Stein" redirects here. For the Dutch chess player, see Elias Stein (chess player). 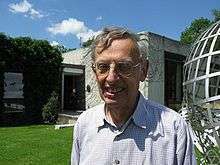 Elias Menachem Stein (born January 13, 1931) is a mathematician active in the field of harmonic analysis. He is a professor emeritus of Mathematics at Princeton University. Stein was born to Elkan Stein and Chana Goldman, Ashkenazi Jews from Belgium. After the German invasion in 1940, the Stein family fled to the United States, first arriving in New York City. He graduated from Stuyvesant High School in 1949, where he was classmates with future Fields Medalist Paul Cohen, before moving on to the University of Chicago for college. In 1955, Stein earned a Ph.D. from the University of Chicago under the direction of Antoni Zygmund. He began teaching in MIT in 1955, moved to the University of Chicago in 1958 as an assistant professor, and in 1963 became a full professor at Princeton, the position he currently holds. Stein has worked primarily in the field of harmonic analysis, and has made contributions in both extending and clarifying Calderón–Zygmund theory. These include Stein interpolation (a variable-parameter version of complex interpolation), the Stein maximal principle (showing that under many circumstances, almost everywhere convergence is equivalent to the boundedness of a maximal function), Stein complementary series representations, Nikishin–Pisier–Stein factorization in operator theory, the Tomas–Stein restriction theorem in Fourier analysis, the Kunze–Stein phenomenon in convolution on semisimple groups, the Cotlar–Stein lemma concerning the sum of almost orthogonal operators, and the Fefferman–Stein theory of the Hardy space and the space of functions of bounded mean oscillation. He has written numerous books on harmonic analysis (see e.g. [1,3,5]), which are often cited as the standard references on the subject. His Princeton Lectures in Analysis series [6,7,8,9] were penned for his sequence of undergraduate courses on analysis at Princeton. Stein is also noted as having trained a high number of graduate students (he has had at least 51 students, according to the Mathematics Genealogy Project), so shaping modern Fourier analysis. They include two Fields medalists, Charles Fefferman and Terence Tao. His honors include the Steele Prize (1984 and 2002), the Schock Prize in Mathematics (1993), the Wolf Prize in Mathematics (1999), and the National Medal of Science (2001). In addition, he has fellowships to National Science Foundation, Sloan Foundation, Guggenheim Foundation, and National Academy of Sciences. In 2005, Stein was awarded the Stefan Bergman prize in recognition of his contributions in real, complex, and harmonic analysis. In 2012 he became a fellow of the American Mathematical Society. In 1959, he married Elly Intrator, a former Jewish refugee during World War II. They had two children, Karen Stein and Jeremy C. Stein, and grandchildren named Alison, Jason, and Carolyn. His son Jeremy is a professor of financial economics at Harvard, former adviser to Tim Geithner and Lawrence Summers, and was appointed to the Federal Reserve Board of Governors by President Barack Obama in 2011. Stein, Elias (1970). Singular Integrals and Differentiability Properties of Functions. Princeton University Press. ISBN 0-691-08079-8. Stein, Elias (1970). Topics in Harmonic Analysis Related to the Littlewood-Paley Theory. Princeton University Press. ISBN 0-691-08067-4. Stein, Elias; Weiss, Guido (1971). Introduction to Fourier Analysis on Euclidean Spaces. Princeton University Press. ISBN 0-691-08078-X. Stein, Elias (1971). Analytic Continuation of Group Representations. Princeton University Press. ISBN 0-300-01428-7. Stein, Elias; Shakarchi, R. (2003). Fourier Analysis: An Introduction. Princeton University Press. ISBN 0-691-11384-X. Stein, Elias; Shakarchi, R. (2003). Complex Analysis. Princeton University Press. ISBN 0-691-11385-8. Stein, Elias; Shakarchi, R. (2005). Real Analysis: Measure Theory, Integration, and Hilbert Spaces. Princeton University Press. ISBN 0-691-11386-6. Stein, Elias; Shakarchi, R. (2011). Functional Analysis: An Introduction to Further Topics in Analysis. Princeton University Press. ISBN 0-691-11387-4. ↑ "Stuyvesant High School Endowment Fund". Retrieved 2013-07-07. ↑ List of Fellows of the American Mathematical Society, retrieved 2013-08-05. ↑ Beals, Richard (1980). "Review: Lectures on pseudo-differential operators: Regularity Theorems and applications to non-elliptic problems, by Alexander Nagel and E. M. Stein" (PDF). Bull. Amer. Math. Soc. (N.S.). 3 (3): 1069–1074. doi:10.1090/s0273-0979-1980-14859-4. ↑ Ricci, Fulvio (1999). "Review: Harmonic Analysis: Real-variable Methods, Orthogonality and Oscillatory Integrals, by Elias Stein". Bull. Amer. Math. Soc. (N.S.). 36 (4): 505–521. doi:10.1090/s0273-0979-99-00792-2. This article incorporates material from Elias Stein on PlanetMath, which is licensed under the Creative Commons Attribution/Share-Alike License.